We all strive for perfection - but sometimes perfection is not possible. When it comes to shooting stance, a scenario will often force you to use an "imperfect" stance. So how do you train so you can still make your hits? 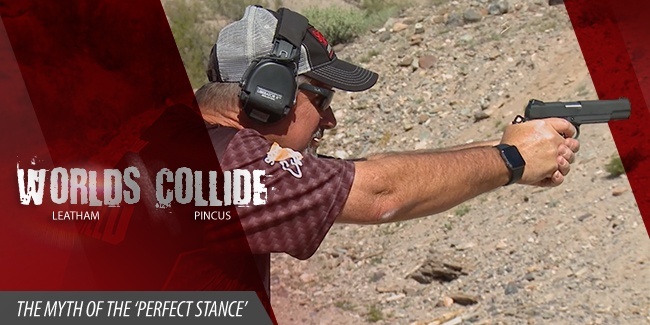 Welcome to "Worlds Collide," bringing together the perspectives of two of the shooting world's top minds, Rob Pincus (Personal Defense Network®) and Rob Leatham (Team Springfield™). Expecting to obtain the perfect "training" shooting stance is all well and good. But it's not realistic. When it comes to real-life fast-shooting or competition scenarios, your stance has to be about getting acceptable hits on target as quickly as possible. It's always a speed versus accuracy equation. You sometimes have to make "less than optimal" work in order to win. The fact of the matter is, as the Robs will demonstrate in the video above, driving your torso forward while you're shooting (to accommodate for recoil) helps resist pushing your frame back, keeping you in control and on target. Don't let your balance move to your heels. Trying to being comfortable and statically balanced is wrong. You have to absorb and resist the forces of recoil - and that is hard to do standing straight up. Achieving the perfect shooting stance isn't a reliable goal. In fact, there are drills you can try that prove, even in a non-ideal shooting scenario, your body will know what to do to achieve a stance that still maintains accuracy. Place a target at desired distance. Put a short obstacle in your shooting area, such as a chair. Begin moving around the obstacle. Shoot at the target while continually moving around the obstacle. Keep moving until the mag is empty. The beauty of it is, your body compensates for the movement and learns how to move and find balance. So quit trying for perfection in your stance - your body will instinctively know what to do.